WASHINGTON (March 13) – Tens of millions of Americans drink water contaminated with chromium (VI), a compound the Environmental Protection Agency was poised in 2011 to conclude likely causes cancer. 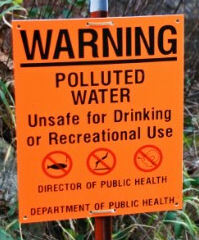 That finding would have set the stage for stricter drinking-water standards. But industry-funded science has caused the process to stall. Today, the Center for Public Integrity and the PBS NewsHour will tell the story behind the delay, focusing on Hinkley, California, where environmental activist Erin Brockovich made her name and residents are forced to drink bottled water because of chromium (VI) in their wells. The EPA delayed its assessment of the compound to wait for new studies paid for by the American Chemistry Council, a trade group. The EPA planned to complete the assessment in 2015, but after the Center and PBS began asking questions about the delay, the agency posted a revised timetable showing that the effort would be finished this year. The Center’s story can be found this morning The Center for Public Integrity's website. The NewsHour segment will air this evening (check local listings). The Center for Public Integrity write, "This story is part of our ongoing investigation, ‘Toxic Clout’: More than 80,000 chemicals are on the market in the United States, with hundreds added each year. The Environmental Protection Agency and other regulators are supposed to protect the public from contaminants in air, water and consumer products that can cause cancer and other illnesses. But the chemical industry's sway over science and policy is powerful. Toxic Clout explores how the industry's actions create uncertainty and delay, threatening public health. About the Center for Public Integrity: Founded in 1989 by Charles Lewis, the Center is one of the country's oldest and largest nonpartisan, nonprofit investigative news organizations. Our mission: To enhance democracy by revealing abuses of power, corruption and betrayal of trust by powerful public and private institutions, using the tools of investigative journalism."